This is not my first time watching Ferris Bueller. Nor is it my tenth time, honestly. I’ve seen this movie more often than I can remember, and yet it’s great every time. And isn’t that what you want from an excellent film, something you can watch over and over again but not get tired of? I think ‘timeless’ is the word, because here I am almost thirty years after it was made, still laughing at the same jokes. And what’s more, the movie is all about the 80s, it’s not meant to be vague, it’s meant to show what life was like growing up in the Midwest in the 80s. And it shows that perfectly, while somehow giving all of us something to relate to, even if we were just out of diapers when the movie was released. How can a movie be so specific and yet so appealing? Ferris Bueller is the hero of the story; a character larger than life, someone we all want to be, the epitome of youthful freedom. Ferris doesn’t enjoy school all that much, and as the end of his senior year of high school approaches he feels to urge to ditch yet again. He knows that this will be his last hurrah before graduation and he’s going to make it count. With the help of his best friend Cameron, Ferris tricks the dean of students, gets his girlfriend out of class, and head off to Chicago for one amazing day. The gang drive a classic car, visit a museum, see the Cubbies, go to a parade, and basically enjoy a day that seems tailor made for the young and the restless. Ferris is famous for never getting caught, but this time his nemesis Edward Rooney is hot on his trail, along with his jealous sister Jeanie. Keeping his school-skipping a secret this time will be harder than ever, but if anyone can do it that guy is definitely Ferris Bueller. Where to start, where to start. I don’t think any movie has ever had more fun. It’s non-stop laughs, excitement, quotable line, cool characters, and outrageous behavior. But behind it all is a real honest look at what it’s like to be a young person facing their future and knowing that irresponsibility won’t last forever. There is something in Ferris and Cameron that we can appreciate. The friends are so different, and yet they love each other and compliment each other, allowing us to find pieces of ourselves inside their good and bad traits. The direction of the film might be the best I’ve ever seen. It’s basically flawless, with a perfect eye for detail, humor, and compassion. And that’s where the movie gets you; it’s entertaining, but deeply touching as well, more so because it just seems so real. 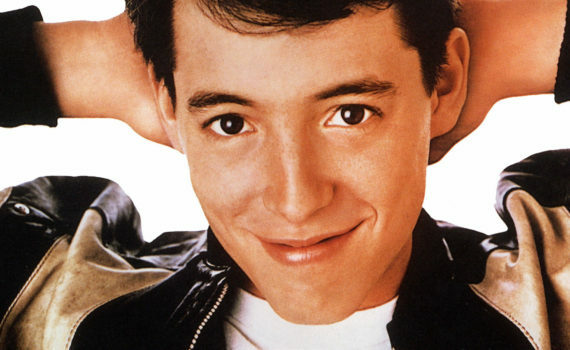 Every scene is something that you yourself could do, but maybe only Ferris could pull off. Singing in a parade, catching a fly ball, driving a Ferrari; every scene seems classic and just so Ferris. What a phenomenal film, filled with everything you could want from ninety minutes spent in front of a TV. On the very small chance that you haven’t seen it, please watch Ferris Bueller.